The moment a warehouse worker walked free after becoming trapped beneath thousand of tons of cheese has been captured on a mobile phone. 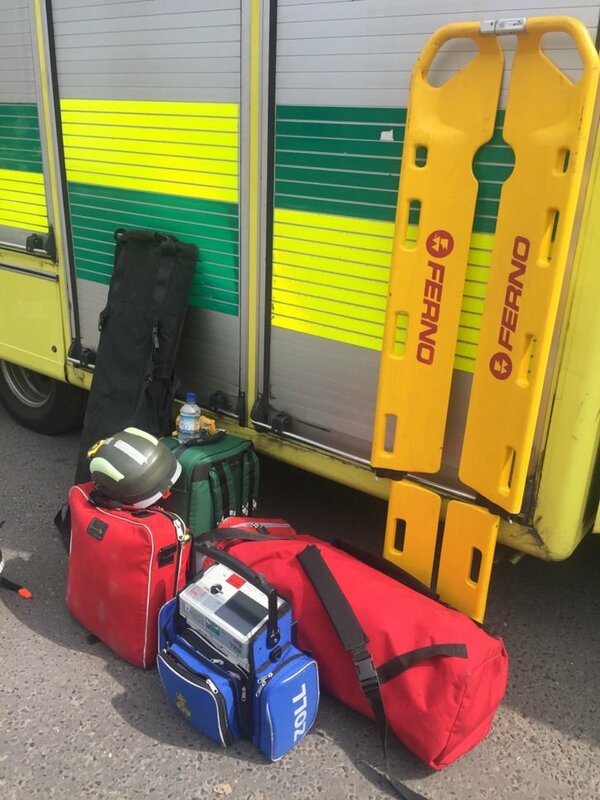 West Midlands Fire and Rescue Service released the footage of Tomasz Wiszniewski, who survived after shelves holding goods collapsed on him last Friday in Market Drayton. The Health and Safety Executive investigation into the collapse at a warehouse in Shropshire, which left a man trapped for hours, will begin in earnest on Monday. Investigators will return to Edwards Transport near Market Drayton to try to establish how the collapse happened. A worker who was trapped for hours underneath tonnes of cheese was pulled from the building virtually unscathed, after hours of searching on Friday. It's thought he was saved by the cage on his forklift truck. A cordon is currently in place around the building. 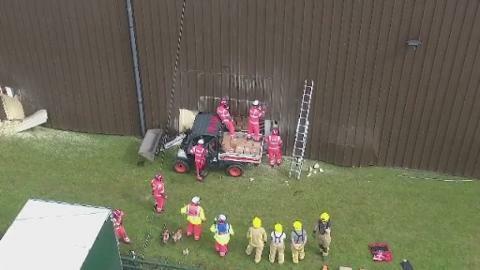 A forklift truck driver is lucky to be alive after he was rescued from underneath thousands of tonnes of cheese. Rescuers had started to give up hope after racks of shelving collapsed at a warehouse in Shropshire. But after eight hours, and what Shropshire Fire and Rescue Service have described as their largest ever rescue, the worker emerged pretty much unscathed. Chris Halpin has the story. A worker has been rescued after 4,000 tons of cheese collapsed on him in a warehouse in Market Drayton, in Shropshire. He was trapped for eight hours today after shelves full of goods came down on him at Edwards Transport. Here is a video from the scene, from Shropshire Fire and Rescue Service's Charlie Cartwright. A man trapped inside a warehouse has been rescued. Shropshire Fire and Rescue Service have confirmed the worker missing after a warehouse collapsed in Market Drayton has been found alive. Rescuers are currently talking to him. Video from from inside the warehouse shows the extent of the collapse.